Recent events with the CSM Emergency Summit minutes (or lack thereof) and the subsequent dissenting CSM voices on EVE Radio, assorted blogs and various other gaming media have brought the relationship between CCP and the CSM (and therefore the players) to the fore once again. Please feel free to take part in the Blog Banter, for more details, see here. The following are some useful links to resources relevant to this discussion. Funky Bacon interviewing The Mittani, Trebor Daehdoow and Seleene on EVE Radio. Jester’s Trek post showing average concurrent users, referenced in above interview. 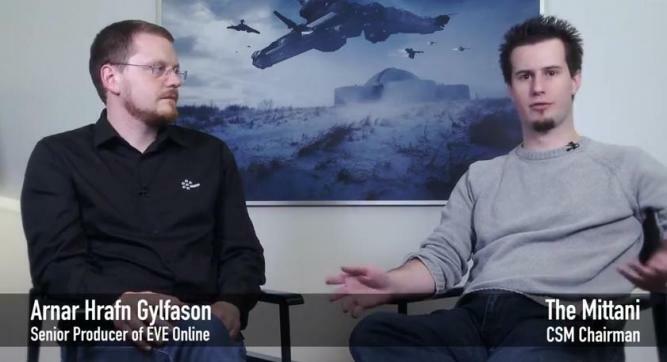 CCP CEO Hilmar Pétursson Youtube interview discussing relevant topics (April 2011). The offical Devblog published following the June Emergency Summit. CSM member Seleene’s account of the Emergency Summit. CSM member Trebor Daedoow’s account of the missing Emergency Summit minutes. CSM chairman The Mittani’s analysis of the current situation on Kugutsumen. A statement by The Mittani as a result of the above articles can be found on the new EvE Forums here. A good account of the developments so far (Sep 8th 2011) has been written by Orrakus and published on EVE Stratics: CCP Faces Longevity Concerns from its Playerbase. 14:22gmt on 9th September 2011, CCP publishes the controversial CSM Emergency Summit Minutes. A refreshingly positive spin on the future of EVE from MMORPG’s coverage of CCP’s recent PAX Prime appearance. “Amidst the recent forum activity about reports of decreased subscriber count, discontent about lack of resources allocated to “Flying In Space” (or, as we know it, Eve Online) and, despite Gridlock and Team BFF’s efforts, general stagnation when it comes to fixes and improvements, the CSM just met with CCP’s Senor Producer for Eve Online: CCP Zulu. As they are written, I will link the community responses below. * Whilst not actually claiming to be a BB entry, this excellent post by a CSM representative was perfectly timed and addresses the banter topic superbly. ** Again, not cited as a Banter, but relevant discourse from a CSM member. Timely topic given the PCU graphs going around this week. Very interesting choice of topic. I hadn't intended to write a blog entry for this, but you can blame Rixx Javix for this.